With the cool and crisp days of Autumn weather just around the corner, اشکنه eshkeneh, this creamy and delicious onion and fenugreek (shanbalileh) soup, seems to be the best choice of food to serve your family and friends. 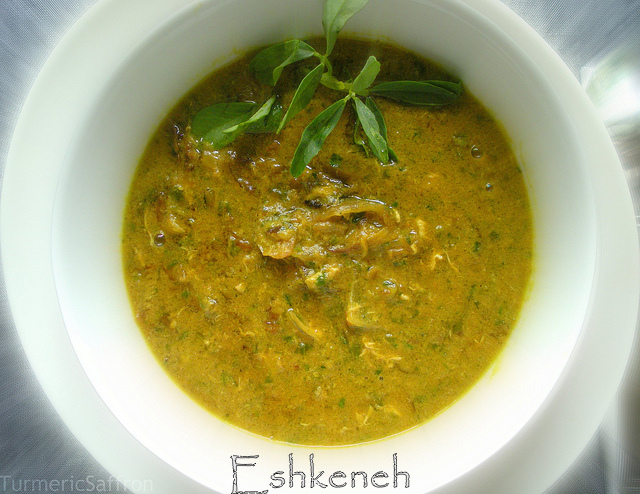 Eshkeneh is a traditional soup made with gold brown caramelized onions, fresh aromatic fenugreek and the last-minute addition of eggs. The result is a fantastic soup that warms your soul as well as your body. Fenugreek has high nutritional and medicinal values and is used in Persian cooking, for instance in our very popular Ghormeh Sabzi dish. Eshkeneh was the dish that my mother would make whenever she felt homesick while visiting us and the rich aroma and the familiar flavor would ease her longings. However, for me, the slightly bitter taste of fenugreek took some getting used to but it eventually grew on me and now I just love the taste and I grow it in my garden whenever I get my hands on some fenugreek seeds. I have heard that in some parts of Iran eshkeneh is made without fenugreek and another variation is to add small potato cubes to the soup. Heat 3 tablespoons oil in a pot, add the onions and saute over medium heat until golden brown. Add turmeric, stir and cook for a minute or two. Stir in the flour and mix well with onion and turmeric which will help thicken the soup. If you prefer a thinner soup, omit this part. Then add the chopped fenugreek and saute for 5 minutes, stir well to mix all the ingredients. Add 4 cups of water, salt and pepper to taste. Bring to a boil, reduce heat and cook for 30-40 minutes on medium-low heat. Break the eggs into a small bowl and beat well with a fork or whisk until well blended, add to the soup and mix well. Add additional water if necessary and adjust the seasoning before serving. Serve hot with warm bread and yogurt. I am very intrigued by fenugreek, wish I could find it - the soup sounds delicious with it! 5 Star foodie, fenugreek may be available in any Persian or Indian grocery store. I am making this for my hubby too! I made your ranganak and my husband fell in love with it. I hardly to see fresh fenugreek..most the time I used dry one. Can I subtitute the dry one for this soup ? I love your foods and ur blog :) you are great ! Mom's The Little one, you can use dry fenugreek but fresh fenugreek makes the soup taste so much better. 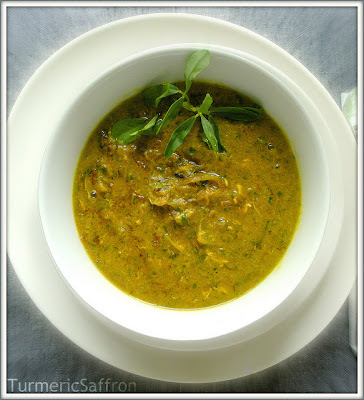 Love fenugreek, love this recipe. It's so simple, elegant, and nourishing. I will definitely try it soon. Fenugreek is my new friend! Can't find the fresh one here, only frozen! Will definitely try this soup soon! This soup sounds so enticing! Love the fresh fenugreek, I would not dream of making it without the fresh herbs! You can remove the bitter taste of fenugreek if you soak it in water with some salt for 20 minutes and rinse.